I thanked her, moved my car, and then started what turned out to be a very long day and interesting experience – attending Saviour’s Day, the yearly event that the birthday of Wallace Fard Muhammad, founder of the Nation of Islam (NOI). It was my first worship experience of the year that was outside of the Christian experience, and I was excited about that. After attending, talked to a friend who is Black, and a Muslim, and when I was describing my experience, she was quick to correct me and say “The Nation is NOT Islam” – but the people that I shared my experience with on Saturday would beg to differ – and no matter the definition, I had a memorable experience for several hours on that Sunday. As I looked around, one thing that stood out was the appearance of those attending the event I saw women in white head garments and long white dresses down to the floor, and white shoes. I saw some women who appeared to be dressed as royalty, with intricate outfits and headdresses. The majority of the brothas were in suits, and I saw a fair amount of bow ties. I was wearing a black dress and opaque black tights, but due to the length of my coat, I appeared to be wearing a red coat and black hose. I felt self conscious about that and found that interesting. I don’t generally worry about whether I am too modest or not modest enough – I generally fall somewhere in between. But I found myself wondering if I should have taken more care in what I was wearing – until I saw some young ladies wearing much much less than me, and some young men wearing their pants sagging, etc.. So, suffice it to say, there was a wide spectrum of fashion choices, and the phrase “come as you are” did certainly apply. As I was trying to get my bearings and figure out where to go to get a ticket and get inside, I -bought a commemorative version of the Final Call, a newspaper published by the Nation of Islam in Chicago. I got in a line that appeared to be headed in the direction of the United Center, and was told then I was in the line for the brothas. Several helpful men directed me to the line for the sistas, which was considerably shorter, and I was happy about that. It also struck me that due to that interaction, and many more that day, I found myself feeling very feminine and worthy of protection as I walked to the line of women. For someone who generally feels as if she has to do everything herself (coming from a family of four women, there was never really too many opportunities for me to tell some male person to carry my bag, or help me with my luggage – we were raised to do for ourselves), this was a different but enjoyable experience. There were so many “officials” – men with Fruit of Islam hats, and women who were dressed in red and white who obviously had security/coordination roles. They were shouting “No cameras at all in the building” – so I turned off my iphone and hoped that no one would try to take it. I found it curious that there was a mention of no cameras, as most cell phones have cameras in them – so it seemed a bit futile to confiscate cameras. But I suppose it was a matter of respect. Respect was a term that I considered over and over again during the process of lining up to enter the building. After buying an overpriced ticket (my fault, not anyone else’s – somehow I thought if I bought a more expensive ticket I would be closer to the stage, which turned out not to be true), I was told that women were to go in one door and men in another. I wondered if this had some cultural significance, and it did to a certain extent – there was a lot of “Sister (Ladies) First” comments made –and in the lines the women in white and red were pulling pregnant women and women with small children out of the line to allow them to enter first. “Sister, you shouldn’t be standing in line and you are pregnant” said one of the ladies in white and red, “That’s the next generation you are bringing forth. That’s new life.” There was certainly an air of cultural order and chivalry which was refreshing. It appeared that the culture of “taking care of women and children” was strong or at least appeared to be. As the line moved toward the entrance to Gate 7 of the United Center, I looked to my left and found it ironic that I was looking at the sign for Malcolm X College. Given the history of the Nation of Islam and Malcolm X, I wondered if anyone else was noting the irony. I thought of that phrase as I stood waiting to enter the United Center; being in this sea of Black people, I did feel like I was in a soup full of people who were “down for Black people” — a place where everyone spoke the same language and no translation or explanation was necessary. As I approached the door to the arena, it became clear that the separation of women and men was mostly to facilitate the security check, where the ladies in white and red patted me down and checked my purse. My iphone made the cut, and I entered the United Center, after about 45 minutes that it took for me to buy my ticket and make my way through the line. I found myself being hyper aware of the racial mix of the people inside. After being the chocolate chip in many of my early worship experience – now it was a sea of various shades of brown, with a few exceptions. I found myself wanting to ask an Asian woman in white and red what her story was – how she ended up serving the Nation of Islam. It was an interesting juxtaposition from my experiences as the one and only brown girl visiting the church service. The stadium was overwhelming – instead of ads by Coca Cola, Nike, or Home Depot showing on the screens around the arena, there were phrases scrolling on each of the billboards, such as: “Up you mighty nation, accomplish what you will.” Throughout the service, other phrases like that appeared. The experience was culturally powerful. Throughout the day I found myself thinking about the interplay between culture and religion and if and how it really is possible to separate one from the other. This is something that I have been thinking about since my freshman year in college, when I sat, among pizza boxes and popcorn, having my first real “college discussion” with a friend, Becky. I remember her telling me that she was Jewish, but did not believe in God, and my young brain just could not understand what that meant. We had a pretty in-depth discussion about how Judaism was a culture as well as a religion, and given that my high school experience did not have any level of cultural diversity in it, I had never even considered such a thing. I didn’t understand at all and spent a good part of the evening debating with her. Now, I understand that completely, and this worship journey pointed out examples time and time again where culture was front and center, and/or side by side with religious beliefs. 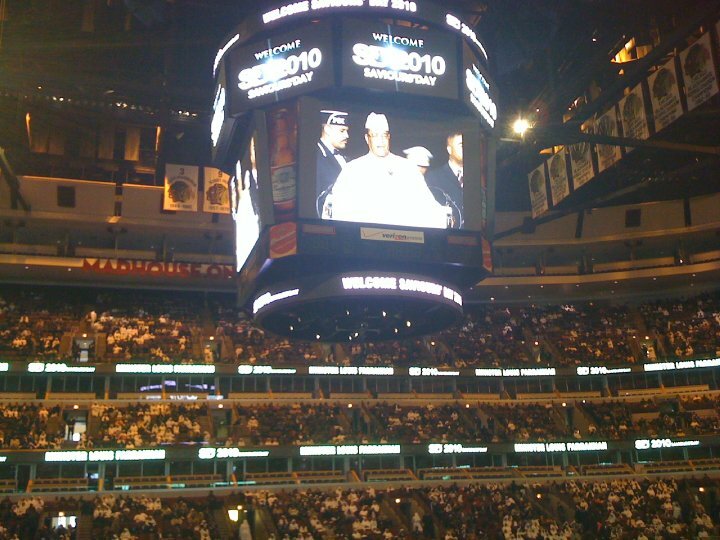 Here at the United Center, I considered that interplay of culture, community, religion and experience once again. There were several opening acts before the keynote speaker came to speak. One thing that I found notable was that in the opening prayers, there was a Christian pastor who prayed, along with the various Muslim imams and leaders who prayed and spoke. After about an hour of preliminary speakers, announcements, and even some singing, The Honorable Minister Louis Farrakhan approached the podium. The man spoke for about three and half hours. I have no idea how I could ever speak for that long. He just kept going like the energizer bunny. And, given that there had been some rustlings about his health in previous years, I found it even more amazing that he just kept talking with power and enthusiasm and authority. As he talked, I had a chance to consider many different things. My ignorance about the Nation Of Islam on more than a surface level made some of his discussion very confusing. Some of it was religiously confusing, and some was historically confounding. I found myself at times saying, “Why is that important?” when he harped on a specific point. For example, he spent a lot of time talking about his insistence that Elijah Muhammad was alive for longer than they said he was. Why is this important, I wonder? It made me want to do research. I also found it interesting that he compared the confusion about how Elijah Muhammad died to how there were different historical accounts of how Jesus Christ died. He spoke for some time about visions that he had – specifically one detailed vision that involved a wheel-shaped spaceship. As he described this vision in detail, I had to consider my ambivalence about believing in visions, etc – so few religious people these days talk about visions in the same way that is done in the Bible or the Q’uran. But he was talking about prophesy and visions, and with a certain level of conviction. Coming from a West African family, discussions about visions, premonitions, and evil are nothing new to me. There is a lot of experience-based story telling about these topics. Often when someone is ill, there are stories about certain animals showing up (such as a crow, or a snake), and having to be prayed away. Often people have dreams about things, both good and bad, before that thing happens. Generally when these things are communicated to me, I just listen, sometimes with skepticism, confusion, or a sense that good gracious, I have enough to think about without thinking about enemies of the spiritual realm voodoo, or juju. I did the same as Farrakhan talked about the wheel. “There are some things that you must say, despite what the people think” – talking about how he has to tell the truth even when it’s not popular. To be frank, 50% of the time that I listened to Farrakhan speak, I was confused. But, the other 50% of the time, I found myself nodding my head yes, and standing and applauding. I found that the 50% of the time I was confused was about specific historical/cultural relevance to the Nation of Islam. The 50% I was in agreement was when Farrakhan spoke about cultural self reliance, and standing up as a great nation of people of color who need not be afraid of their own power, contribution, and ability to help themselves. . At some point, he mentioned that “He said he was talking to the 40 million people of color in America, the 4 Billion people of color in the world, “and some Caucasians as well…” He is very clear on his purpose. By the end of the day, I was drained. It was a long day, unexpectedly long. And as I drove home from the event, I was dismayed to remember that I had forgotten to buy a darn (delicious) bean pie.